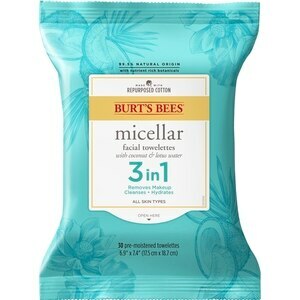 Make your skincare regimen a breeze with 3 in 1 Burt's Bees Micellar Cleansing Towelettes. Burt's Bees Micellar Cleansing Towelettes are formulated with Australian White Cypress oil and honey extract to gently remove lingering makeup, gently cleanse away pore-clogging dirt and oil while nourishing your skin. The 3 in 1 Micellar Cleansing Towelettes are easy to use, simply pull out a towelette and wipe away dirt, oil and makeup without harsh rubbing or rinsing. This non-comedogenic botanical blend of cleansing and softening ingredients are gentle enough to use twice a day to clean and tone your skin, leaving it feeling naturally hydrated and revitalized. Designed for all skin types, these cleansing wipes will leave your skin radiantly healthy. They are 99.5% natural, dermatologist and ophthalmologist-tested and contain no fragrance, no parabens, phthalates or petrolatum. Give your skin the best nature has to offer with Burt's Bees. Burt's Bees Micellar Cleansing Towelettes, 30 Count: Water, pentylene glycol, honey extract, callitris columellaris leaf/twig oil (white cypress oil), lactic acid, sorbitan oleate decylglucoside crosspolymer, glycerin, alcohol, potassium sorbate, limonene. Burt's Bees Micellar Cleansing Towelettes, 30 Count: Gently wipe eyelids, face, lips and neck to cleanse the skin morning and evening. Dispose of towelette in a waste bin, do not flush. Dispose of used towelettes in trash receptacle. Do not flush.